We’re all abundantly familiar with the concept of ‘retro rock’ bands studiously reenacting sounds and styles from the earliest days of metal’s history. However, on their debut longplayer, Prelude, Lancaster quartet Wytch Hazel aren’t content to look back merely 40 or 50 years for their inspiration. 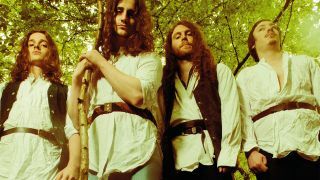 Wytch Hazel is Colin’s brainchild, inspired by the challenge of melding these ancient musical ideas with 70s prog-folk and NWOBHM chops. But despite his affinity for the oldest of old days, he baulks at the suggestion that he was born too late.